This post is a work in progress and is far from being a definitive stance. Rather it is somewhat exploratory/tentative/philosophical based on experimentation using the CRM 2013 form designer. It may well be tweaked over time based on additional findings, user feedback etc. In previous versions of CRM, the "default" design for forms was pretty straight forward. That is, when configuring a form, you could feel fairly "safe" in terms of selecting the "tab with one section and two columns" design option in terms of your starting point. Sure on occasion when you knew you were adding lots of check box controls you might elect a 3 or 4 column section or conversely a 1-column section for a sub-grid. But the point is that you felt fairly certain you couldn't go too wrong in picking the "tab with one section and two columns" option in terms of how the form would render i.e. you were pretty certain that all fields would be easily visible and if the form was lengthy, you could easily add new tabs to simplify form navigation. Maybe it's just me but I'm finding that I'm struggling a little bit more with the CRM 2013 forms. 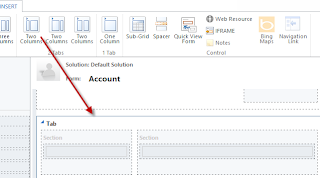 Suddenly we have a whole lot more form real estate to work with such that forms that used the previous "tab with one section and two columns" standard layout (2011, 4.0, 3.0, 1.2) , look rather sparse when viewing in CRM 2013. For example take a look at the upgraded contact form in 2013. This is not helped by the fact that Microsoft has essentially eliminated the tab "jump" navigation option such that you have a lot of "scroll and hunt" in upgraded forms. As an aside, I personally don't know if eliminating the tab navigation is a long term decision - it seems to me that this could easily have been incorporated without compromising the look and feel of the 2013 form layout (e.g. by having a drop down where the general tab is showing or just having the tab names going from right to left at the top of the page). In contrast, they have indeed enabled a jump menu which enables navigating to different forms, so perhaps the long term design objective is to break up long forms into multiple mini-forms. Not quite sure at this point. 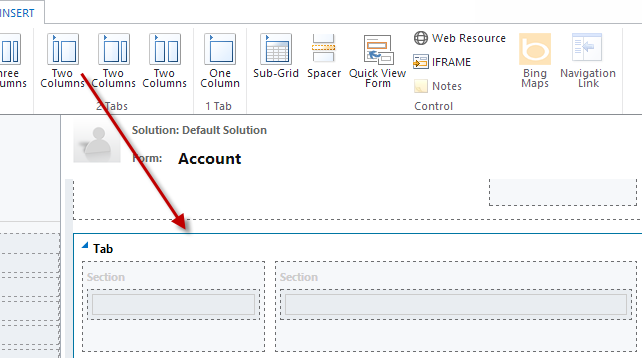 But for now, I have to say that the lack of incorporating this tab navigation "bridge" to aid in navigation for forms upgraded from previous versions of CRM eludes me. 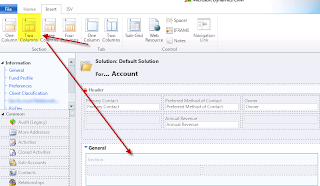 Anyway, the point of this post is essentially to be able to define a new "default" for CRM 2013 forms. There are definitely a lot more form design options - a simple comparison between the 2011 and 2013 forms illustrates this. We jump from having 2 tabs options to 6 tab options - this increases the form design options exponentially. And while there are benefits to having more options there are also downsides to having so many choices. And correspondingly I've been finding that I've tended to vacillate a lot more than I did when working with previous versions of CRM. 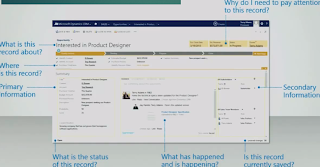 And so I've been looking for guidance as to how to go about thinking about form design in CRM 2013. But the most I've found is the following diagram which is Microsoft's take on form ergonomics. The form should not look too sparse with all the new form real estate i.e. take advantage of the new space that is available on the form such that the need for scrolling down is greatly reduced. Bring sub-grids that will be commonly accessed to the body of the form so that most of what the user will need will be right in front of them (I'll refer to these as "prominent" sub-grids). Consider the laptop/tablet experience where monitors are smaller - some things that fit nicely on your maximized form on your desktop monitor will be cut off on these somewhat smaller screen resolution sizes. 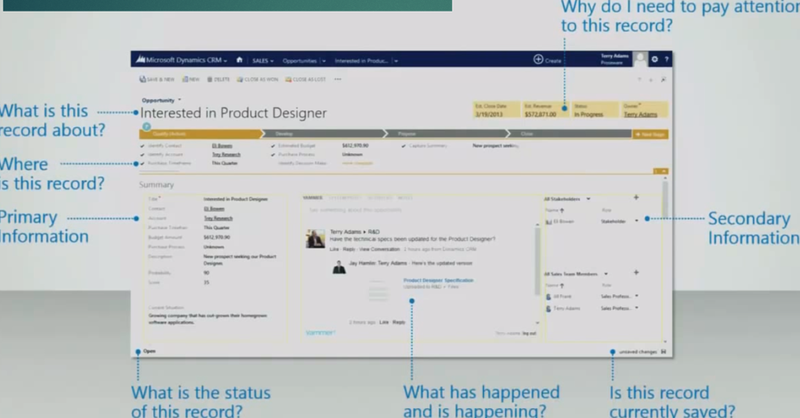 We can also take a look at how Microsoft designed the core entity forms - account, contact, lead, opportunity - to hopefully draw some inspiration (as presumably they also took into account the above considerations). Any form where notes/activities is something that is relevant/tracked - I'll follow the guideline that Microsoft has used which is the "3-Column Varied Width" for the first form tab with the notes/activities in the central column using the new activity, notes and post control. This doesn't leave a generous amount of space for the other "prominent" sub-grids which we'll place in the third column but we'll live with that. Any form that doesn't have notes/activities but has other prominent sub-grids - I'll be employing the "2-Column Varied Width" for the first form tab. The right column will be for the prominent sub-grids with a more generous allocation of space. Any other form sections that are just a listing of fields - I'll be employing the "3-Column Equal Width" tab option. That's pretty much it. 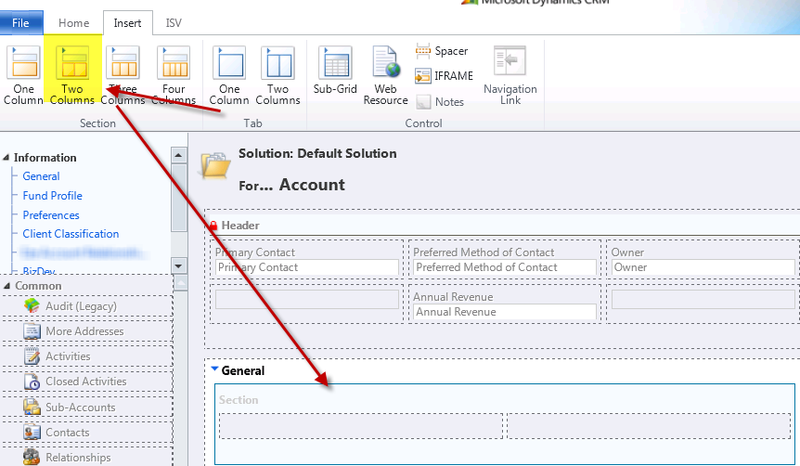 This more or less throws out the "tab with one section and two columns" which was the staple of previous versions of CRM - it just looks way too sparse in CRM 2013. In fact, as a general guideline it throws out having any section with more than one column (all the examples shown above have tabs with multiple sections, not sections with multiple columns - a tad confusing). As if you do add additional columns to the sections shown above, then you're bound to run into issues with fields being cut off when the actual form renders. When you boil it down, it means that I will be limiting myself to the 3 form options below when designing the initial CRM form (using the 3 points mentioned above as a general guideline to determine when to use each option). ... with perhaps a few exceptions here and there for very specific requirements. And then of course, forms can subsequently always be tweaked using one of the other myriad options based on user feedback. As I mentioned at the outset - somewhat philosophical - but this guideline helps me take quick and clinical decisions in terms of form design that I can confidently feel will will function as a very good starting point. This is fantastic! Thank you so much. I hadn't considered the Three Column tab option. It is way better than a One Column Tab with 3 column section.